This special needle decided to use his eye to see - and found himself in the process. 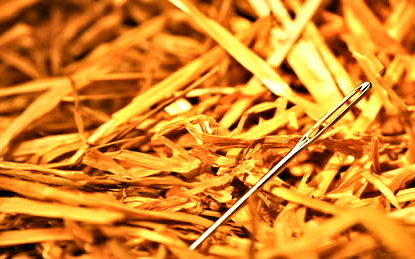 After being casually discarded by a midwestern seamstress fed up with her sweat-shop work conditions and her employer's low-budget equipment, a needle named Ned landed in a South Dakota haystack, where, serendipitously, he ended up finding himself. Prior to finding himself in the haystack, Ned says that he'd struggled to find meaning in his narrowly-focused existence. "I couldn't pinpoint it exactly," said Ned, "but it was like there was this thread of self-doubt and uncertainty running through me all the time. I felt a real hole inside me." Not a big hole, he hastened to add - but big enough that certain things seemed to just pass through him, leaving him feeling hollow and dissatisfied with life in general. Adrift in the haystack, where everyone around him seemed similar to him in some ways, and yet also markedly different, Ned hit a breaking point. His last straw was a delicate strand of hay. "It was right before my eye - in the middle of it, in fact - but I couldn't see it because I was so caught up in the fabric of my depression," said Ned. "At that point, I decided to make a decision to use my eye not just as a conduit for loose ends, but to really see." And see he did. He saw that he was surrounded by gold, and he himself was a sparkling band of silver that anyone would be immensely lucky to find. That awareness has remained with him to this day. "I know I'm special," said Ned. "Whether anyone notices me or not."